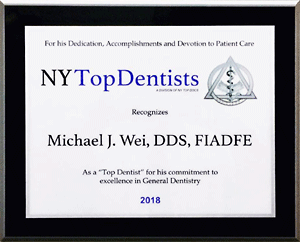 Award-winning Manhattan cosmetic dentist Dr. Michael J. Wei has been given the honor of New York Top Dentist 2018 by the Top Dentists Division of USA Top Docs. 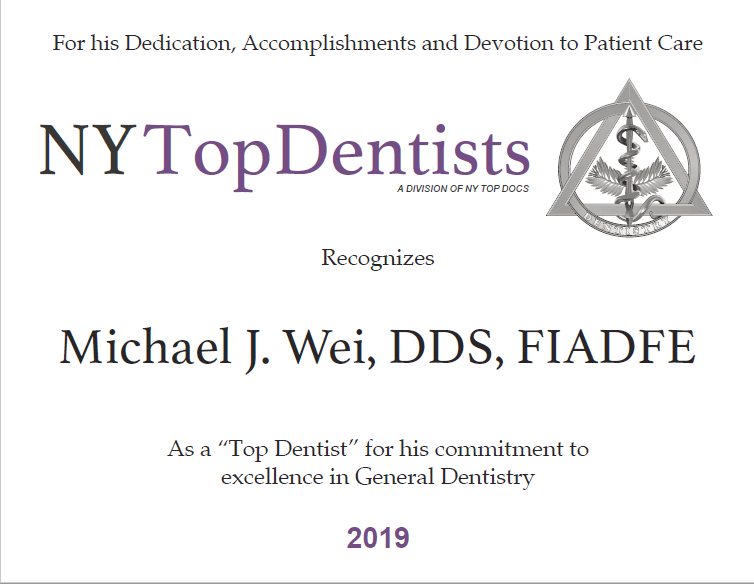 Dr. Wei is privileged to be singled out among his dental peers and recognized for work that he proudly and diligently conducts daily. Dr. Wei underwent a rigorous review process to qualify for this merit-based New York Top Dentist award. “I am extremely honored to have again won the New York Top Dentist award,” says Dr. Wei. Dr. Wei has practiced dentistry for nearly two decades, and he remains focused on learning more, advancing his techniques, and enhancing the cosmetic dentistry and restorative dentistry options he offers to his patients. He regularly attends continuing education courses, seminars, and trainings, most notably at top dental institutes like The Rosenthal Institute for Aesthetic Dentistry in New York and the Las Vegas Institute. He is a member of the American Academy of Cosmetic Dentistry, the New York State Dental Association, the New York County Dental Society, and the American Dental Association. Along with his honor as New York Top Dentist, Dr. Wei has been named America’s Top Dentist by the Consumers’ Research Council of America 13 times in a row. 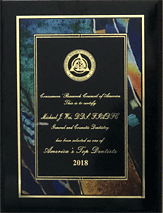 This recognition honors his dedication to outstanding dentistry services and expertise in general dentistry, cosmetic dentistry, and restorative dentistry for his New York City dental patients. Dedication to enhancing overall well-being. Customized dental diagnoses that make sense for the individual patient. Top-quality dentistry in a friendly, comfortable environment. Sedation dentistry options to ease dental anxiety. Comprehensive general, cosmetic, and restorative dental treatments. Excellence is the only option in Dr. Wei’s dental office, and he is committed to improving the health of his patients without compromise. It isn’t necessary to have dental pain or a dental problem to see Dr. Wei. His patients also include people who are interested in enhancing the appearance of their smile alone, and not just its function. No matter what your oral health concern, question, or hope, Dr. Wei can address it successfully so the result is a natural-looking smile that you are proud to show off. General dentistry (dental exams and cleanings, gum disease treatment, TMJ therapy). Cosmetic dentistry (porcelain veneers, smile makeovers, Lumineers, teeth whitening, cosmetic bonding, Invisalign). Restorative dentistry (dental implants, porcelain tooth crowns, fixed dental bridges, tooth-colored fillings). Pursue the smile you want now with the help of a New York top dentist. Whatever your concerns or questions, he can help you find a comfortable and beautiful solution. Contact Dr. Wei to schedule your dental consultation and get on the road to a new you, a new smile, and a happier life.